Sand Dollars 3" - 3 1/2"
These are Real Florida sand dollars. They are great for crafts, wedding decorations and much more! We pack every order in peanuts and bubble wrap in a new box. These are real dried Bleached white sand dollars and are not fake made with resin. 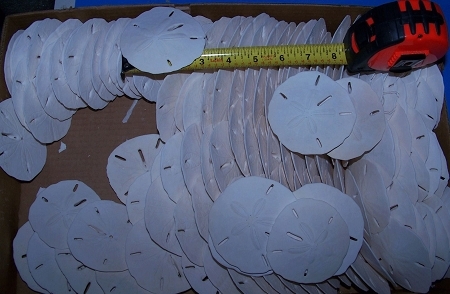 We buy our Sand dollars directly from the Florida fishermen that harvest them and dry them. Here at Northfloridashells.com each bulk bag has extra added to lots of 25 or more. These items are a real sea life product and will have minor imperfections and defects. We offer the best sand dollars on the market. This is a super fragile item damage may and does happen in shipping. Buyers buying this item to be shipped do so at their own risk this item is a NO RETURN ITEM, and we suggest you pay insurance to be covered for damage by the carrier. 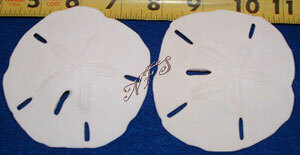 These sand dollars are bulk bag packed and not individually wrapped to the quantities listed in the Quantity you buy. We sell them in quantity Bagged of 25, 50, 100 & 500. No returns will be allowed on this item. Buyers buying this item, please make sure they are the size you need before buying and understand damage will occur in shipping! We always add extra to lots of 25 and more! Great sand dollars only a few were damaged in shipping as expected. Sand Dollars 1 1/2" - 2"
Sand Dollars 2" - 2 1/2"
Sand Dollars 2 1/2" - 3"
Sand Dollars 3 1/2" TO 4"
Copyright North Florida Shells. All Rights Reserved. eCommerce Software by 3dcart.